After a few weeks' wait from its European release, the 3DS eShop in North America gets a piece of portable pinball, with DSi owners getting some balls and bumper action too. Elsewhere there's a little music and some more maths. 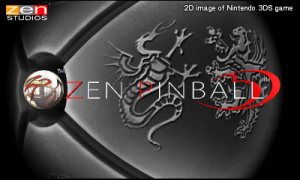 Zen Pinball 3D (Zen Studios, $6.99) — An excellent pinball title in its own right, Zen Studios plans to support this game with extra downloadable tables in the future too, so it's a sound investment. Here's our Zen Pinball 3D review for you to mull over. Hip Hop King: Rytmik Edition (Cinemax, 800pts) — The hip hop music creation studio finally reaches North America after nearly a year's wait and it still sounds good after all this time. Check out our Hip Hop King: Rytmik Edition review for more. 101 Pinball World (Selectsoft, 500pts) — Teyon and Selectsoft's penchant for cramming 101 things into one game extends to pinball now. It's unlikely 3DS owners will buy this instead of Zen Pinball 3D, but we'll review it anyway to see how the two stack up. Carmen Sandiego Adventures in Math: The Case of the Crumbling Cathedral (The Learning Company, 600pts) — Another instalment in the maths-and-masonry series, this likely won't change anything from the previous outings but our review will see how it adds up. Kirby: Right Back At Ya! Volume 1 (available 14th January at 3 p.m. PT) — Kirby's ready for action in part one of this special, two-part 3D episode of Kirby: Right Back At Ya! That's all, folks. What are you getting this week? NO I THOUGHT THIS WAS FOR THE WII!!! KIRBY!!!!!!!!!!!!!! No 3DS VC makes me a sad panda. HAHAHA I hated Kirby Right Back At Ya when it was on TV, but the opportunity to see it in 3D on Nintendo Video may be just novel enough to get me to do so. In case you couldn't tell that was sarcasm. I guess they've already run out of Gameboy games. From now on, any week where I don't see the 3D Classics version of Kid Icarus is a bad week. Lame? No....Atrocius update. It is the second week without a VC game. Pinball what the hell??? Nintendo NA must be out of their minds! No Kid Icarus, no Mario in 3D. I think they like to loose money. That is the only explanation. Although I already two versions of Zen Pinball im still hyped that i'll finally have a chance to play this version in a few hours. NO VC GAMES WHATSOEVER!?!?!?!!?!?!!!?!?!?!??!?!!?!?!?!? WHAT'S WRONG WITH THE WORLD!?!?!?! Any update with Pinball is a good in my book. This 101 Pinball looks horrible from the videos! I don't see any reason to complain. It isn't amazing but Zen Pinball looks great and Rytmik would be good if I didn't already have rock edition. This is average. Atrocious is that week where Europe got a version of Golf that was worse then NES Open Tourney Golf. Did they even get anything else that week? I'm really starting to wonder why us in the United States haven't gotten 3D Classics : Kid Icarus. I am crying at this update for lack of Kid Icarus. How can people call this a bad week? This is a great week! I've been waiting for Zen Pinball ever since it came out in Europe. Plus some Kirby action on Nintendo video is great as well. emaan1...i really think that we will not get this game. I mean, it was a no brainer to release but so far, no news of it to NA have surfaced. bboy2970 if the Zen Pinball came with some VC game, i could agree with you. But since i think Pinball is meant to be played on real Pinball machines and the other releases were just as weak (for me), it is a bad week. 10$ for 4 tables? Wow...that is stealing fair and square! Blah, nothing for me this week. I don't like pinball. I was hoping for some good VC. Also hoping that we get Sakura Samurai next Thursday! 'Tis been many moons since I saw something on a Wii Shop update that I wanted to purchase. I miss the good ol' days when I eagerly anticipated the updates... now I don't even remember the update is coming. Kirby Right Back At Ya and another Carmen Sandiego, I'll call this a great week! Just because the games released don't appeal directly to you doesn't make it a bad week. Rytmik and Zen Pinball are both awesome for fans of their respective genres, and the Nintendo Video update is also pretty sweet. So it's not like NoA is releasing junk this week. That said, I question why it's so hard to provide at least one 3DS Virtual Console game each week - Nintendo's catalog alone should be sufficient to make this happen. Virtual Console has long been dead on Wii. I don't understand why NoA is already trying to kill the portable version with an irregular release schedule. Kirby: Right Back At Ya! Woo hoo! I used to watch that show on the FoxBox along with TMNT and Sonic! I wish we could download it to our 3DSs though. I bet y'all anything Nintendo will be making this Kirby episode available for purchase on the eShop in the future like they did with those Dreamworks things. don't feel badly about spending my $ on Telegraph Crosswords, now. i needed something different than regular games, love crossword puzzles and it's tough enough to be interesting/fun. AWWWWWW YEAHHHHHHHHHHH Zen Pinball and Kirby! I got the 3D Classic and Dream Land (Thanks Club Nintendo!) yesterday, so I'm geared up for the anime episode. The shop updates at Noon EST right? Yes the eshop updates at 12 Noon eastern. I've been waiting for Zen pinball since it was announced. Super excited for it but wondering why it cost more for NA then Europe? Also that Kirby 3d show looks interesting. Aww man... Still no Wario Land 1? Oh well. Someday. Really though... the anime Kirby show in English is pretty damn bad... Just sayin'... Still, it's really cool to think we can watch it. I guess this week is Pinball Week. @shen8888 We'll probably get Kid Icarus next month through Club Nintendo. i wan sakura samurai T_T still no news for it .... zen pinball is a nice game? should i get it? The handling of the 3DS VC is even more unacceptable than the handling of the Wii's VC has been lately. NoA is run by a bunch of incompetent fools. @balrogthemaster hi...the kirby dream land that redeem from nintendo club...this kirby series can eat the enemy and get their power ? So how do you watch the Kirby cartoons? is that an England thing or am I just not finding it? Yeah...i think they are trying to run this whole thing to the ground! Anyone remember when we were 3 Wii VC games a week? Those were the days.... Wasn't there some talk about Double Dragon II NES? I don´t know why it is so hard for these NoA idiots to release VC games. The things are small...i really don´t understand why they do this crap. Just less than a hour ago d/led Kirby's Dream Land via ClbN(Club Nintendo). I probably won't get either of the pinball games this week, as I have no points, or later as I don't necessarily think I'll want either. I do like pinball, though, & preferably on a real pb machine. Edit: Could be a worse week, guys, err, ladies, & gentlemen. I do wonder though, about the VC inconsistencies. Edit2: I don't plan on purchasing a whole lot of 3DS VC over the course of my ownership of my new 3DS, save but favs I've played, & others I'm interested in trying. However, my mentality isn't everyone's. So I hope NoA gets it straight, for everybody. I got Majoras Mask for free last night! Maybe I'll start getting the Carmen Sandiego games. Well, it's a bout dang-diggity time I got my pinball fix. Will download this weekend. If you think about it, 101 Pinball Worlds is 5 bucks for 101 tables while Zen is 7 bucks for 4 tables so 101 Pinball Worlds is a better buy for your money. Of course, Zen has much higher production values but if you just want to play random pinball on occasion, 101 Pinball Worlds may fit your needs more than Zen. No more VC Wii games, and 2 continuos week without VC 3DS games too!! I can see into the future. Next week there will be no Wii VC. Apparently any and all good NES, SNES, Genesis, N64, TG16, NeoGeo games have been released already. And it also seems the same goes for Gameboy... I really wish the idiots at NoA would wake up. Y'all are a bunch of complainers. Has everyone completed all 10 FREE GBA games (for early adopters) or fully beaten 3D Land or unlocked all 100-or-so Freakyforms or finished all 250 Pushmo/Pullblox puzzles yet? Not to mention the "free"ish games you can download with coins, at least in the US. But you're right, what a horrible week, and Nintendo is stupid and lazy. Damn it. Hate to get lured in. Next time, I'll ignore the sounds coming from beneath that bridge. Finally, something worthwile on Nintendo Video. Oh yeah, I just downloaded Zen Pinball. Been waiting a long time for that one. But did anyone else notice that "Pinball Pulse - The Ancients Beckon" is also available for 3DS now. It was formerly one of those DSiware games that didn't make it on 3DS. Yep, and I understand that you can now finally transfer that game from your DSi, though I haven't tried doing so yet. @62...I wouldn't recommend transferring any DSi games to your 3DS. DS and DSiware games just look better on the proper hardware. I just don't have a DSi, and it's nice that I can finally download Pinball Pulse. The lack of a button input for nudging the table is what keeps me from getting Pinball Pulse. I share people's frustration about the Wii shop. We want better Wii Ware titles, and more Virtual Console games. Nintendo continues to not listen to the fans( and I'm sure the majority of them are not asking for more Carmen Sandiego educational games) Is this what the future will hold for the Wii U online store? @Heavy_Barrel: #67 "Is this what the future will hold for the Wii U online store?" Possibly, & probably. Pinball Pulse is amazing game.. I put about 100 hours into that 5 dollar game literally. Ive found myself playing through and realizing its 3am.. and i need sleep.. so put it in sleep mode to continue the next day.. sort of wish it has online leader board.. cause nobody can beat me!!! Downloaded Zen Pinball. If you like pinball, I'd say it's well worth the money. I'm currently hooked on the Excalibur table, and using the shoulder buttons for the flippers feels real good. Hope they release more tables as DLC eventually, though. I'll get it when I got have money. This update seems bitter to me because...well...there is no Kid Icarus 3D Classic or Resident Evil Demo! I don't want much NoA. Just a new game...once a week.... Okay maybe that is a LITTLE much. The Zen pinball game makes up for the lack of any VC titles this week. Zen Pinball is great. It feels like real pinball and is just as addicting. Hearing that there will be DLC tables later on makes this an even better buy because that pretty much quenches my Pinball thirst. Lack of any VC stinks, but at least we got this. I just picked up Zen Pinball 3D, and I must say, I am very impressed with this game. I didn't like the DSiWare version at all, but this one is a big leap forward. I am just hoping they release more tables in either updates or DLC packages. Whichever is fine. Solid week for me. I won't have internet for 2 weeks so after that I hope some good things release on the eShop! I already have Zen Pinball on my PS3 and Xbox 360 but I still picked this up for my 3DS today. I was extremely impressed with the 3DS version. The tables are excellent and the 3D effects look incredible. A very high quality title and totally worth the price. Even if you don't care about pinball this game may change your mind. I recommend giving it a try. Zen Pinball rocks. It actually managed to pull me away from Mario Land all night, and that's no small feat considering that I only just picked up Mario two days ago. Kirby + Nintendo Video = AWESOME!! Bleh, nothing again for me. I have to say that while none of these games are for me, and the lack of any VC is disheartening, it's not THAT bad of a week. Zen Pinball is a popular HD title that made it's way to 3DS. Think about that, an HD game known for it's DLC has made it's way to a Nintendo portable. That's something I doubt will happen often. I hope for original tables down the line. At least for those that like pinball and double dipped. Also Kirby 3D for Nintendo Video is a nice surprise. If the video is entertaining enough, I hope they sell it for $1.99 on eshop like they did with those Dreamworks videos. Overall, I'm still one of the few that look forward to Nintendo download every week. What will we have next week? Sakura Samurai? Mutant Mudds? Wario Land VC perhaps? Zen Pinball is excellent! I've had it for two weeks and play it almost every day. The 3D effect is great and the feeling is good. Definitely the best pinball game I've played for a very long time, certainly the best on a handheld device. I didn't get the Kirby video. yeah, I think they might do what they did with dreamwork's NV stuff to kirby- release it on the eshop. I hope they do. I like the Kirby episode but unfortunately there is no way to save it, hopefully it will take a while to replace that video. YAY! Kirby on Nintendo Video!